Review of: ‘EMMET DALTON – Somme Soldier, Irish General, Film Pioneer’ by Sean Boyne. It is quite remarkable that no-one has written a full biography of Emmet Dalton until now, and Mr Boyne is to be congratulated on having done so. His most excellent book reflects his long-held admiration for this relatively unsung Irish patriot and is written with the warmth and regard of one who has delighted in finding common ground with his subject (they attended the same school). Emmet Dalton, by the way, is not to be confused with the Emmett Dalton (note different spelling) who was a member of the notorious Dalton gang in 1890s America and who would become a Hollywood film star of the 1930s. Born in the USA but raised in Dublin from the age of two, the Emmet Dalton who is the subject of this book enjoys a privileged and fairly idyllic childhood in the warm bosom of a prosperous, devoutly Catholic and fervently nationalist family. At sixteen he is running illicit guns into my own grandparents’ village, Ballyhaunis in County Mayo, and at seventeen he joins the Royal Dublin Fusiliers as a 2nd Lieutenant. He sees fierce fighting at the Somme and is awarded the Military Cross for his own bravery. Like so many thousands of his fellow Irishmen, he goes to fight with the British against the Germans, then later chooses to fight against the British for an independent Ireland. His valuable military skills and experience are put to good use in training the Irish Volunteers and his ability to pass himself off as a British army officer enables him to mount an audacious if unsuccessful attempt to free senior IRA commander Sean MacEoin from Mountjoy Gaol, using an armoured vehicle stolen from the British military. His bravery and his commanding presence greatly impress Michael Collins and a strong bond quickly develops between the two men. Soon Dalton becomes Collins’ close friend and right hand man, acting as his Director of Intelligence, and is Chief Liaison Officer with the Irish delegation which sets off for London in October 1921 to enter discussions with the British over the Anglo-Irish Treaty. He takes the lead in the discussions on defence issues and thus his role in establishing the Irish Free State is an undeniably pivotal one. He will go on to establish Ireland’s Defence Forces. Ever loyal to Collins, it is Dalton who leads the fight against the anti-treaty forces in the ensuing Civil War, directing the bombardment of the Four Courts and leading the sea-borne invasion of Cork. It is Major General Dalton who is seated at the right hand of Michael Collins during the fateful journey through Bealnabath when the ‘big fellow’ is shot and dies in Dalton’s arms. Dalton will never fully recover from this tragedy. Boyne continues to follow Dalton’s career beyond his public life, and charts his rise and his successes as a film maker. Hooking up with such Hollywood magnates as Sam Goldwyn, Dalton becomes the pioneer of Ireland’s film industry, establishing the country’s first film studios at Ardmore in Bray, County Wicklow and attracting a great array of Hollywood stars to the country. He is the founding father of what remains today one of Europe’s most successful film industries. Boyne’s book is the culmination of a huge amount of most thorough research and, although factual, is written in a compelling and pleasing style. His account of the killing of Michael Collins I found unexpectedly moving. Other writers’ accounts of the two month long treaty talks are often confused and conflicting and indeed Boyne’s research was not able to establish for certain whether Dalton was physically present at the actual signing of the treaty which took place in the early hours of the morning of Monday 6 December 1921. He does not mention that the signing actually took place at Heatherden Hall in Iver, Buckinghamshire. I mention this fact only because Heatherden Hall would, in the following decade, become Pinewood Film Studios, and this is somewhat ironic in view of Dalton’s future career in the film industry. The Pathé Films newsreel of the event (which wrongly states the signing took place at 10 Downing Street!) clearly shows the signatories and delegates emerging, along with King George V, onto the distinctively balustraded upper terrace at Heatherden Hall. The amount of research which Boyne has invested in this unique book is impressive. Dalton was so well connected and so deeply involved in the heart of the independence movement that readers will find a great many famous names of the Irish Revolution here, including Ernie O’Malley and Tom Barry. The truth behind the rumours of Collins’ love affairs is also explored. Moreover, the detail Boyne includes of Dalton’s family (and the book was written with the consent and collaboration of Dalton’s daughter, the film actress Audrey Dalton) helps present Dalton the man, as well as Dalton the legend. This is a great read for anyone interested in the period of Irish Independence and the Civil War and I cannot recommend it highly enough. This week, I have had the privilege of interviewing Stan Fletcher, author of Inside Looking Out. Stan Fletcher is the nom de plume of a writer whose first book gives an honest account of his time spent at Her Majesty’s pleasure. Her Majesty may have derived some degree of pleasure from his incarceration but, as you might expect, there was little joy in the experience for Stan. Unlike his virtual namesake who did his ‘Porridge’ in the highly popular TV comedy series, Stan tells a grittier, true story; one which reflects the fears and frustrations of an intelligent man held in an anachronistic and inadequate prison system. His experiences portray a system which is underfunded and which is, some might conclude, run for the benefit of the prison authorities, not to reform the prisoners in any way. Those of you who have read my own first novel A Wistful Eye – The Tragedy of a Titanic Shipwright – will have seen the anti-hero of that true story managing to retain both his sanity and his humanity, mainly by having access to the written word. It saddens and angers me, therefore, to learn that prisoners’ access to reading materials – many of which are freely and generously donated for their use – is being restricted and in many cases denied altogether. As someone who was trained by the Home Office and the Samaritans as a Suicide Awareness trainer, I have learned that two major factors which lead people to depression, despair and suicide are isolation and an inability to communicate with others. From the days of prison reformer Elizabeth Fry, and right up until the 1940s, our prisons enforced the ‘silent and separate’ system. This was partly punitive and partly to discourage conspiracy, rioting and inter-prisoner violence. It was realised however that this was a major cause of depression and suicide amongst the prisoner population and therefore it caused greater problems than it sought to solve. Forward-thinking 20th century prison authorities realised the importance of education, self improvement and communication as tools in prisoner reform and prison harmony. Now, even as more and more non-English speakers enter our prison system, we are witnessing a major retrograde step in education and communication. This can only lead to greater isolation and increased problems for both prison and prisoner. Q What prompted you to write your book? A Firstly I was astounded by the whole experience and after 2 months and normally being a mentally active person I needed to do something to occupy my mind. As time went by I became more and more concerned over the ways the judicial and prison systems treated individuals and I thought it was an experience worth sharing. The adage about innocent until proven guilty is certainly not the case in the UK (eg. Cliff Richard). Q Who do you believe is your ‘target audience’? A Primarily those people working in the Justice arena and those facing a prison sentence, or their friends and family, but it can be of general interest to anyone as one of its main focuses is relationships. Q Did the prison authorities offer you any encouragement, writing classes, writing materials, use of IT facilities etc., with this project? A Lol no. Our education was cut from one day per week to 3 hours per week. Q Did you find it therapeutic to record your prison experiences? A Yes, it was something I needed to do to keep myself sane. Q Are all the characters and situations real or are some invented or exaggerated? A All are real but names have been changed to protect the individual. Q Clearly your book is unique to you, but was this a one-off or do you feel that perhaps you have another book inside you? A One never knows about these things. There is one but let’s see if I ever put pen to paper again. Q How do you feel about the proposal to limit prisoners’ access to library books? A We only got to visit the library once every blue moon. It’s a crazy situation and nothing is done to reduce offending. OK, reading the Beano is unlikely to be able to do that, but for someone who cannot read it is the first step to literacy. Most people in prison were there because of drug habits and most had minimal education and no usable skills and no job. Somewhere the cycle needs to be broken. Prison is an ideal opportunity. 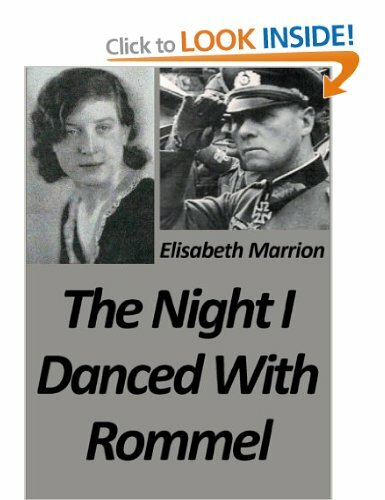 This week I have had the pleasure of interviewing Elisabeth Marrion, the very talented novelist, whose début novel The Night I Danced with Rommel was snapped up by publishers, not just in UK but also in Germany. The Night I Danced with Rommel is the first in a family trilogy entitled the ‘Unbroken Bond’ series. The second book in the series Liverpool Connection, is just published also. I was born in Germany not long after WWII. My father was a corporal in the RAF, stationed in my home town, Hildesheim. There he met my mother, who had lost her husband on the Russian front, during the last days of the War. Q: When did you move to England? It was in 1969. I only intended to stay for one year to improve my English, then another year and another year, and I am still here. I met my husband David. Together we formed an importing clothing Company. Through this company we worked many years in the Far East and the Sub Continent. We worked very closely with a manufacturing Unit in Dhaka, Bangladesh. We helped set up a school in the rural part of Bangladesh for further education, something which had not been available in the rural areas at that time. Q: Do you still have ties to Germany? My brothers and sisters still live there but not all in our hometown. I go over at least twice a year and my family come to stay with us here in England as well. They totally understand why I fell in love with it and stayed. The Night I Danced with Rommel is my mother’s story – a story I grew up with. I always wanted to write down what she told me, just for my family really. But then I realized that not many people know what Life was like for normal families living in Germany during WWII. I then wanted to share her story with a wider Audience. Q: At what stage did you decide to make the book into a trilogy? As soon as I put pen to paper, or as it is nowadays, fingers on keyboard, I knew it would be a trilogy. I call the series ‘Unbroken bonds’ the first book is Hilde’s story, the second book Liverpool Connection is Annie’s story and the third one Cuckoo Clock –Esther’s story. Q: Did you find it difficult to write about Germany History whilst living in England? Since the books are written as a novel and not as a historical document it was not difficult at all, especially since it is my mother’s story. The only problem is German people do not like to talk about the war, and my generation did not learn anything about it at school. This meant I had do to a lot of research which would was painful at times. Q: How well is the book received in England? Surprisingly well. And what I find astonishing it is of interest to the elder and the younger Generation. Field Marshal Rommel was well respected throughout because of his humanity and his effort to end a pointless war. Q: How long did it take you to write and publish the first book? I was under a little bit of time pressure. I wrote it for my best friend Moe from Detroit, Michigan. At that stage she was already bedridden and my daily chapters I forwarded for discussion kept her going. I choose the self-publishing route, which meant that Moe could hold the book in her hands a week before she passed away. Q: What are the second and the third books all about? Whereas the first book is family life and events in Germany, the second books follows Annie’s Life from leaving Ireland behind to find a better Life in Liverpool. Only things do not turn out as she and her friends had imagined. This book recounts how my father, a Corporal in the RAF, came to meet my mother in Germany. The third book, Cuckoo Clock, tells the story of Esther, a young Jewish doctor, having to leave Germany after the Kristallnacht [9th November 1938]. Q: Is there a message in your books? I would love my books to be read at school as part of their history lessons – both here in England and in Germany. I would consider it an honour to go and speak about them there. Question: Has your book been translated into German? Yes, I was very lucky. A small German main stream publishing house contacted me after reading the English version of the book. It has now been released under the title: Mein Tanz mit Rommel. Q: What books influenced your writing? I think it was Follow the Rabbit Proof Fence by Doris Garimara Pilkington, the story of her mother, a part Aboriginal girl who was taken by the British from her home in rural Australia and sent to the city of Perth. She escaped, twice, and walked home following the rabbit proof fence. Q: What are your favorite books, films and albums? As a teenager, I loved reading Novels and plays by Oscar Wilde, Thornton Wilder and Ernest Hemingway and short stories by Guy de Maupassant. Also I am always fascinated by books which are based upon true stories, books about Russia, such as Cancer Ward, and books by Solzhenitsyn. As for a film which I would enjoy seeing again and again (besides Rabbit proof fence), there are many. You might get the impression I am a simpleton (Am I allowed to say that?) but I like films such as Heaven can wait, with Warren Beatty. It makes me laugh every time. I like many films but would I want to see them again? One thing I do not like, is that, having read the book, I would rarely watch the film afterwards because I have already envisaged the characters. Q: What are you doing when you are not writing? On retirement we moved to the South of England and live opposite the Isle of Wight. I love getting up really early, listening to the news with a fresh cup of coffee and going out for a long run before breakfast. I love running; I have run in three London Marathons and one in New York. Like most people I love to travel and I was lucky enough, because of my work, to spend a lot of time in the Far East, Middle East and the Indian sub-continent. Q: That brings me to the question, if you are going to a remote island what would you take along and who would you be taking with you? Honestly? I think I would take all the books by Solzhenitsyn and Guenther Grass plus I think all the books by Erich Kaestner – he was one of the writers banned during the ‘Third Reich’. Who would I take with me? A hypothetical question, correct? No offence to my husband or mother but I would take my best friend Moe. We could have endless discussions. Q: If you could invite just one guest to a dinner party who would that be and why, and what would you cook? I would invite Golda Meir. I would love to hear her life story. What would I cook? That is a difficult question because I know little about her customs. I think Kohlrouladen with boiled potatoes – one of my favourite dishes anyway. Q: If I were to ask your friends, which would be your best quality and which your oddest? Without a doubt they would say I am a great organizer. I cannot stop organizing. My friends over the years have become used to it. Oddest? That would describe it straight away. They certainly think I am odd. Who else would walk through their village, the day after she has moved in, in her underwear, walking the dog, introducing herself to her new neighbours? (Alright I forgot my jogging shorts on that occasion, but the village never recovered, or so I thought!) Later on I was elected the chairperson of the village committee. You have to be odd to take that job. Q: Elisabeth thank you for sharing your stories with me. It was a pleasure, thank you for asking me along. Recently, when going through some of my old theatrical scripts and posters from my days with RATS (Rawalpindi Amateur Theatrical Society), an old and suppressed memory arose to confront me. It now occurred to me that this year sees the 33rd anniversary of my arrest – for infringement of Pakistan’s obscenity laws – by the fine, upstanding detectives of Islamabad CID. In 1980, whilst performing the wider role of ‘diplomatic baggage’, that is, not a diplomat in my own right on that occasion but an appendage of my attaché husband, I took on the additional role of Marion, the sassy young thing, the female lead in Terence Frisby’s play ‘There’s A Girl in my Soup’. Written two decades earlier, in the sexually liberated ‘sixties, the comedy reflected the growing trend towards casual relationships and brief encounters, as promoted by celluloid characters such as ‘Georgie Girl’ and James Bond, a trend which was well established, if indeed not passé by the time of our 1980 production. The opening scene saw my fellow actor and male lead (American diplomat Richard) in the role of ageing roué Robert Danvers, as played by Donald Sinden in the play’s debut production, plying the sophisticated Clare Dorlaton-Finch (played by Jan, another British diplomatic wife) and canoodling with her on the sofa, but being thwarted in his attempts to steer her to the bedroom. My own entrance, in a trendy white, Avengers-style, multi-zipped flying suit, run up to my own design by the local durzee, came later in Act I and soon had me sipping whiskey before being kissed several times by the predatory Danvers. The act ended with Danvers and Marion disappearing offset into the bedroom for what would remain unseen but promised to be, in the jargon of the day, a spot of nookie. The curtain fell, signalling the interval and the serving of beverages, and the cast now re-grouped backstage. When I say ‘stage’, the theatre was in fact the front garden of Richard’s house, a substantial suburban property with a huge marble raised terrace which served admirably as a stage, and French windows which led into the Islamabad house but which, for the purposes of the performance, pretended they looked out of a London flat. Admission to the performance was by ticket only and the tickets had been sold only to the diplomatic community, so we cast members naturally felt at ease amongst friends. When we saw our Director/Producer, Max baby, coming backstage, we naturally assumed it was to congratulate his dahlings. However, his pale and panic-stricken countenance, and the two burly members of Islamabad’s finest who followed him, caused us to suspect something was amiss. His usual booming, directorial voice was now reduced to a querulous whisper, as he introduced Inspector F and Sergeant H of the Vice Squad and delivered the devastating news that Jan, Richard and I were under arrest for public obscenity. Notwithstanding the concept of diplomatic immunity, which heads of missions are surprisingly loathe to invoke in any case, I experienced an instant vision of sordid tabloid headlines being read by my disapproving Irish Catholic mother back home (‘I told you nothing good would come of gallivanting to them heathen places!’) and I foresaw the end of a very promising career. Having recently accompanied our Consular Assistant on a visit to a poor British wretch in a local prison, I knew all too well the awful conditions under which I might be spending the next few years. This thought seemed to inspire the equally diplomatic Max baby and he explained to the detectives that the audience was comprised entirely of foreign diplomats, many of them high ranking and well-connected, and that they had all paid for their tickets in expectation of seeing a full and entertaining performance. He pleaded with the detectives to allow the performance to continue and invited them meanwhile to partake of refreshments at one of our two bars (diplomatic functions in Islamic states usually provided a wines and spirits bar and also a separate non-alcoholic drinks bar). The policemen having grudgingly acquiesced, it was with some trepidation that we actors returned to the stage to strut through the remaining two acts. So extreme was our apprehension that we must indeed have given the performances of a lifetime. The romantic aspects of the play were now somehow significantly subdued. In the final act, Marion has returned from a holiday in Paris with Danvers, and is no longer the streetwise oik of Act I, but is now transformed into an elegant sophisticate. As I swished onstage in glamorous amethyst silk, I heard a couple of ladies gasp in of admiration of the outfit which I had created myself from a Hollywood Vogue sewing pattern; the slender cigarette pants and the wrap-over, tulip hemmed dress. All the time however, I was sizing up the back walls of the property and wondering whether I could scale them in my elegant outfit and make a run for it, or whether I would have time to change back into that flexible flying suit in order to make good my escape. The curtain fell to rapturous applause and indeed we had several curtain calls. As Richard, Jan and I took our final bows, our sweaty hands clasped fast in shared foreboding, our attention was caught by some movement at the back of the garden/auditorium. Over by the exit, we glimpsed the aforesaid fine, upstanding detectives of Islamabad CID, no longer upstanding but semi-comatose through consumption of whiskey, being carried out horizontally by their driver, their constables and Max baby, back to their police vehicles. The feeling of relief was enormous as we joined the audience at the bar, where compliments and champagne began to flow. I am pleased to relate that we heard no more about our arrests, as the pencilled notes in the back of my Samuel French edition of the script recall. The incident was the talk of the diplomatic community for a week or two, until eclipsed by the arrest of another diplomat who was caught being served ‘diplomatic tea’ (Paul Masson Californian Chardonnay) from a teapot in a local Chinese restaurant. Undaunted, a mere six weeks later I was again treading the boards, with saucy French accent and figure-hugging uniform, in the role of the Air France stewardess in Boeing Boeing. Those, as we old India hands always say, were the days.